A simple weekday dinner or a fulfilling lunch, this soup is super simple to put together, nourishing for the belly and the soul, as well as totally delicious! We tested this soup on a room full of 6 and unders, and got some super happy smiles and thumbs up from the littles and many happily surprised: “what did you put in that soup?” reactions from the parents. Always a huge compliment! HINT: To make this soup taste extra amazing, make your own veggies stock: simply bring a pot of water and a bunch of loosely chopped vegetables to a boil, add salt, pepper, and any other desired herbs & spices, reduce heat and simmer for as many as 4 hours on low (I like to sauté the onions with some garlic & ginger with a bit of coconut oil first to add a bit of flavour). Strain out vegetables and here you have a delicious & simple vegetable broth. This kind of broth is great to make in the height of market season when there are loads of imperfect root vegetables like celeriac, parsnip, yams, potatoes, celery, carrots, & broccoli, just hanging about. YUM! In a large soup pot, melt coconut oil and onions over medium heat. As onions become soft & translucent, add salt, ginger, garlic, turmeric, and carrots. Cook for about 10 minutes, stirring frequently, until carrots are slightly softened and mixture is fragrant. Add vegetable stock, bring to a boil and then reduce to a medium-low simmer for 15 minutes. Add coconut milk and simmer another 5 – 10 minutes. Serve with a sprinkle of toasted pumpkin seeds and/or a spoonful of coconut cream. Like always, if you make this soup, please let me know how it went! AND, if you don’t want to miss any upcoming recipes, be super to sign up for my email list below! I promise to only send out inspiration, upcoming class info & deliciousness!! Every February, my son’s birthday comes around, and I find myself so busy trying to plan a party, come up with a cool gift, make awesome party food, hammer out a delicious AND nutrient rich birthday cake, while meeting all the requirements of the birthday boy…that when and if the time comes to write out the cake recipe and post about it, I’m just too bagged! Well, this year is different, my friends. 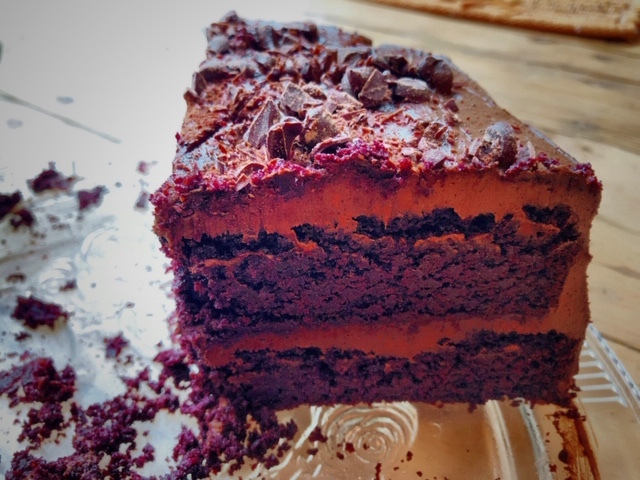 Although none of the above changed in any way, I have taken the time this year to get this recipe to you because it has FINALLY become my favourite, decadent, no-non-food-weirdness-ever, chocolate birthday (or anyday) cake!! And it has been officially taste tested by a pack of the harshest critics….11 year old kiddos! 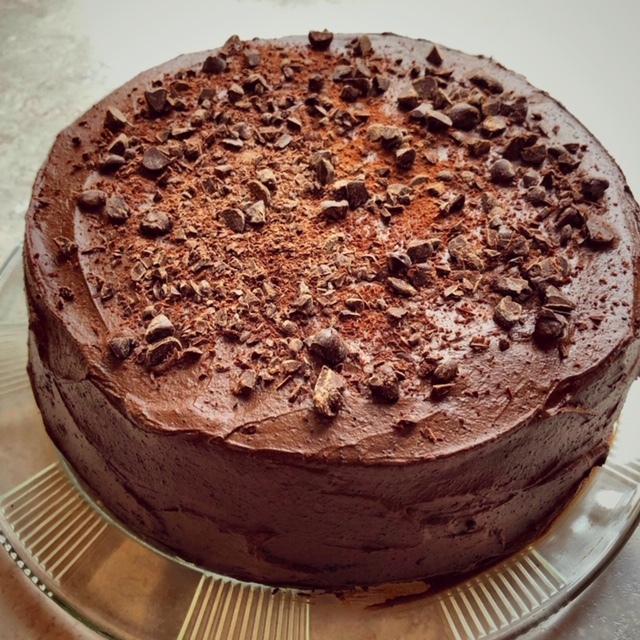 Several years in the making, here’s a birthday cake that can accommodate all the dietary restrictions, make all the tastebuds sing, is moist and not overly dense, AND satisfies my NUTRITIONISTA REAL FOOD requirements (which is not always that easy!). Line 2 x 7” cake pans with parchment paper and lightly grease them with coconut oil. Preheat the oven to 350F. In a large bowl, whisk together the flour, cacao powder, sugar, baking soda & salt, until there are no lumps or clumps. In a separate medium bowl, combine eggs, coconut milk, oil, applesauce, vanilla, and maple syrup, and whisk together until smooth. Pour wet ingredients into the dry mix and combine gently with a large spatula. Do not over-mix. Pour evenly into your 2 cake pans and bake for 30 - 40 minutes until an inserted toothpick comes out clean. Cool completely, preferably overnight, before frosting. For the frosting: In a double boiler (or a glass bowl set over top of a medium pot with a few inches of water) melt chocolate chunks and coconut oil until runny. Transfer melted chocolate mix to the food processor and add in all other ingredients. Combine until smooth and thick. Adjust sweetness as desired (dark chocolate chunk sweetness will vary). For cake assembly: Remove one cake from pan (don’t forget the parchment!) and place on a large serving plate. Evenly spread a thick layer of frosting over the top of the cake (I like to use a small spatula or a bread knife for this). Carefully remove the second cake from its pan and set on top of the bottom layer. Spread all remaining frosting over the top and along the sides of the cake to cover completely. Cake will keep on the countertop for roughly one day, refrigerate leftovers (if there are any 😉). If you make this cake, please drop me a note with your feedback or kitchen dancing enthusiasm!! I want to know how it went and if I need to make any adjustments to the recipe! Chocolate brownie + granola bar. Use real food & feel real good! You will love these, I am so super sure. 1. Preheat oven to 350F. Line a medium glass dish with parchment - mine is 11 x 7”. 2. In a food processor, combine dates, almond butter, maple syrup, coconut oil, and vanilla, until well combined. Add oats, cacao powder, and salt, and process until just combined. Transfer mixture to a medium bowl. 3. Add hemp hearts, cranberries, chocolate chips, and coconut, and stir together with a wooden spoon. Transfer mixture to your lined pan and press with wet hands to evenly distribute. 4. Bake for 25 - 30 minutes until edges brown slightly. Remove from heat and allow to cool. 5. Once mostly cooled, drizzle melted chocolate over top and sprinkle with shredded coconut. Transfer brownies to the fridge to solidify before cutting into squares. Keep refrigerated. Did you make these? Tell me how they turned out! Want to make incredible Holiday Chocolates? Grab this Ebook today! Looking for more recipes like this? Check these out! I have to admit that I have a big time soft spot for my Bonk Bars. They were one of my first original recipes that people were really excited about. On top of that, the honest-to-gosh-golly-goodness truth is that I just LOVE them SO much. They are my absolute favourite bar to have hanging around when I’m training for a distance run, rehearsing like mad for a dance show, or just being the busy body, high-functioning human that I am. They are THE perfect afternoon slump, pick-me-up bar with all those great combinations that we love so much: macronutrient balance, nutrient-density, and total flavour jam! These bars were inspired by a good friend who is hypoglycemic and tends to “bonk” (have a blood sugar crash inducing fits of rage and/or extreme grumpiness) if he doesn’t eat good food regularly. 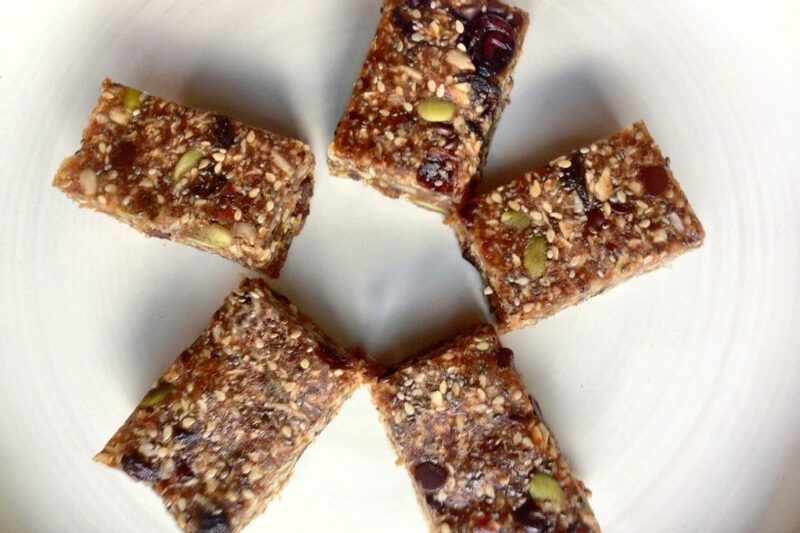 Loaded with blood-sugar stabilizing fiber (dates), fats (coconut oil & chia), proteins (nuts & seeds), complex carbs (oats), and natural sweetness, these are fool-proof bars for active people, athletes, teenagers, regular “bonkers”, and sweet-treat lovers everywhere. Easy to throw together and incredibly satisfying, these will keep well for weeks in the fridge (I dare you to try) and freeze well too! Look out for your friends. Soak dates in boiled water until soft (about 7-10 minutes). In food processor, combine dates and almond butter until smooth. Add oats and coconut oil and pulse until roughly combined. Transfer mixture to a large bowl. Add all remaining ingredients and combine. Pour into a lined 8 x 8 square pan and press down with wet hands until evenly distributed and smooth. Refrigerate for at least 1 hour before cutting into squares. Store in fridge. If you try these Bars and love them (or not), let me know how they worked out for you!! This pudding is SO easy! Just combine all ingredients except berries in a large mason jar and shake, shake, shake it up, Baby! Place the jar in the fridge. An hour or so later, shake it well again making sure the seeds are floating up from the bottom of the jar (I will often use a wooden spoon to get those stubborn ones off the bottom). Leave pudding overnight in the fridge. In the morning, place all ingredients in a blender, adding in your berries, and blend until well combine. Pour back into jar and EAT! Serve with homemade granola or muesli, sprinkled with your favourite nuts & seeds (cacao nibs too), or just straight up. Will keep 4-5 days in the fridge. A truly simple, nut, gluten, dairy, and processed sugar-free, easy cookie recipe. A new staple in our house. At my son’s school, we are lucky enough to not have a “no nut” restriction for lunches, but I know it is very common in schools these days. If you use a lot of whole foods in your kids’ lunch boxes (and I know you do – wink, wink), then getting around the “no nut” thing can be a real challenge. I hope to create a few more nut-free recipes for lunch boxes soon (so stay tuned! ), but for now, here’s one you should be able to bang off quickly and easily. Enjoy! Grab a medium sized mixing bowl and combine the seed butter, honey, and coconut oil with a whisk or a fork. Add in all other ingredients except the seeds and chocolate chips and stir until well combined. Lastly, add seeds and chocolate chips. Roll about 1 or 2 Tbsp of dough between wet hands and place on a lined baking sheet, flattening the balls down slightly. Bake for 12-17 minutes until edges are slightly browned. This is a very new recipe, so if you try them (and I hope you do! ), let me know how they turn out and leave me a comment below! Looking for more tips for school lunches? Check out one of my latest blogs on Your Kids, School, and Blood Sugar! 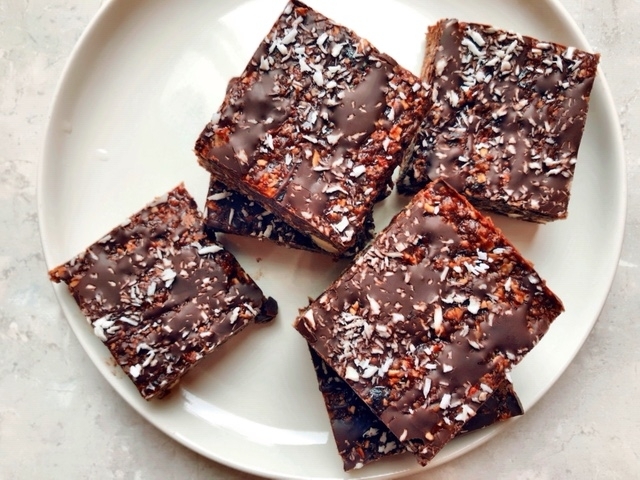 Inspired by some very ripe bananas, a hungry family, and the need to have something on hand for either a quick breakfast or avoiding an afternoon crash, these bars are super easy to whip up, satisfying, and full of flavour. They are gently sweet and so moist, they might be able to pass as cake. AND a little chocolatey goodness is always well received! A great recipe for little people, ravenous teenagers, and busy people alike. Enjoy! Place oats in your food processor and grind into a coarse flour. Place flour in a bowl and whisk together other dry ingredients. Combine bananas, vanilla, applesauce and honey in your food processor and process until creamy. Stir into your dry mixture. Stir in almonds, coconut and chocolate chips. Pour into a lined 8 x 8 pan and smooth the top. Bake for 15-20 minutes until an inserted toothpick comes out clean and the edges are slightly browned. Cool. To make chocolate sauce, stir together all ingredients in a small bowl and drizzle over bars. If the chocolate sauce is too thick, place bowl over a steaming pot of boiled water for a few minutes until slightly melted. Feeding little (or big) hungry bellies something to feel good about! 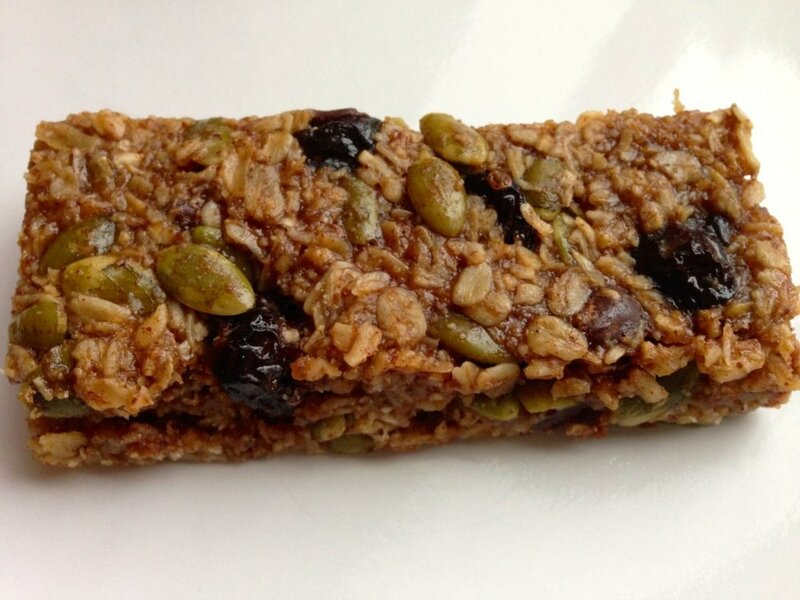 It’s taken me a good while and several tries to come up with a granola bar recipe that is full of good stuff, stays chewy, and is quick and easy to throw together. Here it is. These are super popular with the kiddos, my active lady friends, and the backcountry boys alike. This is a dependable, fool proof recipe, that turns out well every time. Feel free to experiment and add your own flare! Note: if your kids can’t bring nuts to school, simply swap out the almond butter for sunflower seed butter, pumpkin seed butter, or tahini! Preheat oven to 350F and line an 8 x 8 pan with parchment. Combine almond butter and honey in a small saucepan over low heat until just melted. Remove from heat and transfer to a large mixing bowl. Add in all remaining ingredients, stirring until well-combined (I will often use my hands for this). If the mixture seems dry, add a few Tbsps of water at a time until desired consistency is reached. Pour mixture into your lined baking pan and press down with wet hands until evenly distributed. Bake for 30-45 minutes until edges are slightly browned. Cool completely and cut into squares (I like to pop it into the freezer for 10 minutes before cutting). Will keep refrigerated for up to a month. Our summer has finally chilled out enough to turn my oven back on and it’s good timing because my boys were craving some muffins and I was dying to create. I also happened to have some pretty brown, fruit fly lovin’, bananas begging to be a part of something fantastic! These muffins are vegan, gluten-free, and as sweet as brown are your bananas! (The browner the better). Note: if your bananas aren’t quite there yet, pop them in a brown paper bag overnight to quicken the ripening period. Preheat oven to 350F. Line muffin tin with parchment paper or reusable silicon liners. In a large bowl, combine the flour, baking soda, baking powder, and salt, and whisk together. In a medium bowl, mash bananas with a fork. Add in sugar, oil, cream, and vanilla, and combine. Pour wet mixture into dry and stir with a large spoon. Stir in 3/4 cup of shredded coconut and chocolate chips. Spoon muffin mix into the tins and sprinkle with remaining coconut. Bake for 22-25 minutes until slightly brown around the edges and an inserted toothpick comes out clean. Cool completely and store covered with a dish towel to enable air circulation. Note: I like to set half the batch aside to freeze for lunches and watch the others get devoured in just a few days. Enjoy! What makes a really good cookie? And by good, I mean health benefiting, energy boosting, and super satisfying, just to be clear. A truly good cookie can be everything you want it to be AND make your body, mind, and soul happy. What do we love most about cookies? They’re chewy, sweet, salty, satisfying, and usually contain chocolate. When constructing the healthy cookie, we can honour all of these delicious qualifications with a few simple alterations to the average cookie recipe. water, eggs, and nut butters. Sweetness: oh so necessaire!! What’s key to gaining ground in the daily health challenge is to swap out those refined sweetness wannabes (and I mean permanently) for body-loving goodness such as honey, maple syrup, bananas, or dates. Salty: this one’s easy! Just say no to iodized salt. For true mineral uptake and to receive actual nutrition from salt, choose good quality sea salt or pink himalayan salt. Satisfaction: what makes a cookie’s satisfaction meter shoot through the roof is not the sugar and chocolate, my friends, it is the fat + carbohydrate + protein quotient. Using all 3 macronutrients in a power snack allows you to feel full longer, to keep your blood sugar levels stable, and to boost your energy and brainpower in a way that doesn’t mess with your metabolism. Some ideas: for good fat: coconut oil/nuts/seeds; good protein: nuts/seeds/hemp hearts; and good carbohydrates: oats/oat flour/almond meal/banana. Chocolate: be choosy about chocolate! Real dark chocolate is full of beneficial minerals and antioxidants, but don’t let the store shelves fool you! There are many variations on chocolate out there will a LOT of added nonsense. Find some dark goodies with as few ingredients as possible (3), look for cacao in the ingredients list and choose minimal sweetness. Here’s my latest and most ingenious cookie recipe that I am so proud of and that my family and I did the kitchen happy dance for when I first took them out of the oven! The absolute bonus? They’re SO easy! In a small bowl, whisk together chia seeds and water and let sit 10 minutes. In a medium bowl, whisk wet ingredients together with a fork. Add in dry ingredients and combine. Fold in raisins and chocolate chips. Form into cookies of whatever size you like and place on a parchment lined baking sheet. Bake at 325 for 25 mins. Making your own nut milk has unending health benefits. The store bought ones are mostly water, loaded with preservatives to extend shelf life, sweetened with added sugars, and bulked up with stabilizers and thickeners. One of the most common additives we find in store-bought nut milks is carrageenan. There are piles of studies that link this preservative to intestinal inflammation, liver & colorectal cancers, as well as immune suppression and fetal toxicity & defects. Packaged nut milks also tend to have the addition of health depleting vegetable oils and are often fortified with vitamins and minerals that are difficult to absorb and may stress the digestive system and the kidneys. Making nut milk your self ensures that you know exactly what’s in there. There is no processing that removes the nutrient qualities of the nuts (or the coconut in this case), you get to choose your quality of water, you may sweeten it with whatever you like or omit what you don’t, and the satisfaction just has no substitute. It may seem overwhelming to think about regularly pulling off homemade nut milk to feed your family. But honestly, once you get into the groove of soaking the night before and allotting 10 minutes of blending and squeezing, it becomes something far more attainable than just giving it a pass because it’s easier to buy it. The benefits far out-weigh the hassleand it feels pretty good to watch your loved ones glug down your homemade goodness. This here is our current most favourite day-to-day nut milk that we consume in our house. Feel free to swap in the nut of your choice or reduce the sweetness. I’ve been using cashews lately because they are creamy and more affordable than almonds, but this milk is wonderful with almonds. 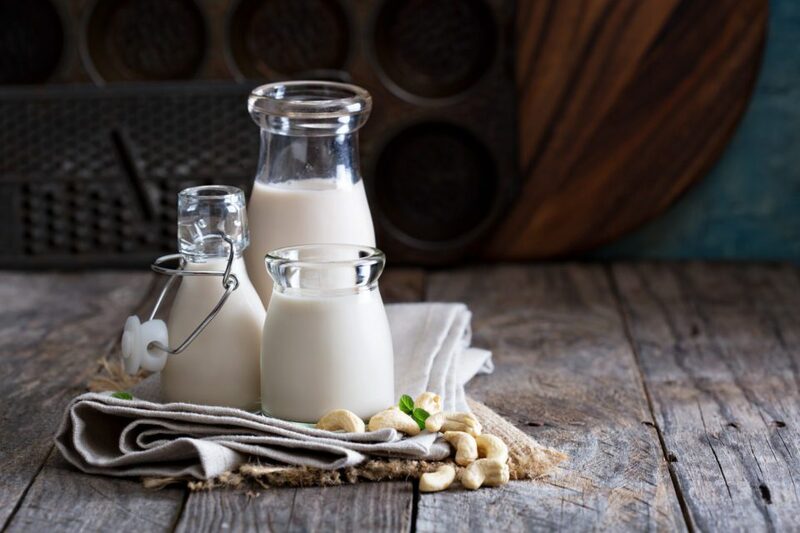 Even if you are unable to keep up with the homemade nut milk demands, just give it a try a few times and see how it feels. My guess: it’s gonna feel pretty darned good. Soak cashews and coconut overnight. Drain and rinse cashews and coconut. Place all ingredients in a blender and blend until smooth and creamy. Strain through a nut milk bag, squeezing as much liquid as possible, and transfer to a large glass container. Will keep for 3-5 days in the fridge. Be the kitchen super star I know you can be. Know what’s in your food & make it your self.